Ohio’s bees are more than honey bees. 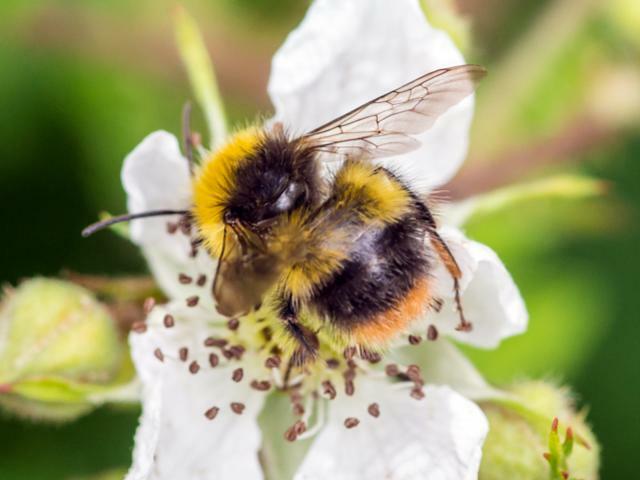 They’re bumble bees, carpenter bees, cuckoo bees and others, and you can identify more than a dozen of them — types you’re likely to see in your garden — using a new pocket guide from CFAES. “Common Bees of Ohio,” a 4-by-6-inch laminated card, is meant to raise awareness of pollinators — bees and their buddies — and the good they do in yards, in nature, and for food and farms. The card is available in quantities of 25 — good for handing out to garden clubs, farm groups and the like — for $9.99 from the college’s online store at go.osu.edu/BeeID. Ellsworth initially created the card as an in-the-field ID aid for about 100 citizen scientists who are helping her with a pollinator study. Details on Ellsworth’s work are on CFAES’s Bee Lab website at u.osu.edu/beelab/. To contact the source: Denise Ellsworth at ellsworth.2@osu.edu.